Advising Programs Coordinator Lizi Lyon teaches the workshop Working With Your Strengths on Feb. 7 at JSC's student leadership conference, “Preparing for your Future." The Johnson State College –sponsored student leadership conference, “Preparing for your Future,” covered a variety of professional-development topics by JSC staff, students, and special guests. The Feb. 7 event, which ran from 9:30 a.m. to 4:00 p.m., was attended by 34 students. That’s up nearly 50 percent from the last one, said Krista Swahn, director of student activities and community service at JSC. Encouraging leadership skills in college students is in her job description, which she said is easy to do for the people who are involved with SERVE or SLAP, groups she works closely with. But to reach the hundreds of other students, she has to create something bigger to attract them, like the student leadership conference. Although the program promotes leadership techniques, she doesn’t think the name reflects the scope it covers. With nine options for workshops available but only three sessions, students had to really to decide what was most meaningful for them at this time. Sessions offered were Transferrable Skills, Resumé Building, Job and Internship Search, Working With Your Strengths, Not Against Them, Time Management for Busy People, Agendas & Meetings, What is Diversity?, Why is Diversity Important in Being a Leader/Awesome Individual/Global Citizen, and Not your Average LGTBQ+ 101. Speakers included new Coordinator of Career Development Beth Walsh, Advising Programs Coordinator Lizi Lyon, Coordinator of Student Athlete Development Kristin Cannon, JSC student and President of the Student Government Association Nasser Abdel-Fatah, and Founder & Dynamic Diversity Facilitator Extraordinaire Meg Bolger. Bolger was flown from Ohio to cover the diversity classes for this conference. She is the co-creator of the Safe Zone Project and is the self-proclaimed “queertastic founder of Pride for All.” Although some people may think diversity classes are only for the closed-minded, she said these classes are relevant because being open-minded to others is only the beginning. “There’s a difference in being open-minded and being educated. A lot of people are unintentionally ignorant. What we see in the media or around us is only a small slice of what exits and is out there,” she said. 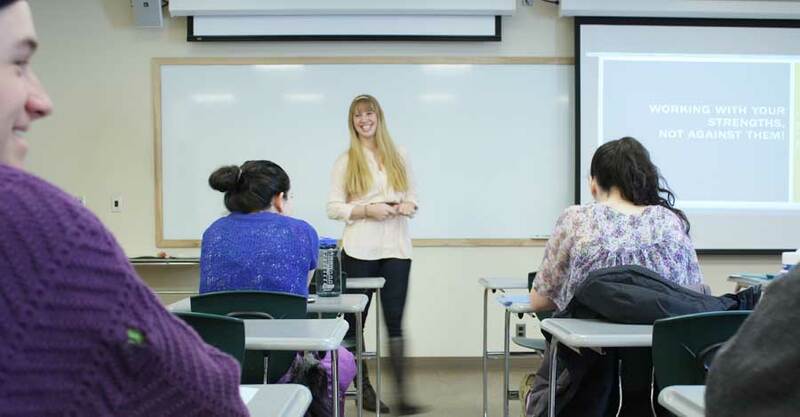 One of the students who were engrossed with Bolger’s classes was Shelby Maurice, a junior with a double major of Psychology and Anthropology and Sociology. For her, the discussion hit really close to home. “I’ve had family members that are gay and I realize now how hard growing up for them was.” She said she has a relative that was ganged up at school and also had to leave a job at a major chain store because they knew he was homosexual. “These classes can help improve interactions… You look at a person and make judgments. It happens. But try to move past that,” Maurice said. Creating a positive atmosphere with co-workers or in tricky situations is exactly what Swahn wants students to know how to do. Usually the leadership conference is offered only in the spring, but feedback indicates students want them more often, so she said she is going to try for one conference like this per semester. In the past they’ve had single sessions at a time, stretched over five weeks, but she said people seem to prefer the one-day event. Anyone with suggestions for events or who wants to know how to gain communication or leadership experience can contact Swahn through her JSC email. She said she will help any student be prepared to enter the workplace with confidence.